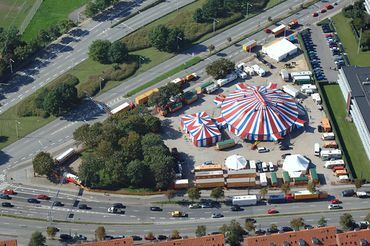 Cirkus Benneweis was, until 2015, Denmark's premier circus, and one of Europe's oldest circuses still in the hands of the same family: It celebrated its first one-hundred years in 1987, and was still going strong after more than 130 years of uninterrupted activity—until its "temporary" closure in 2015 for a "revamping" of the organization that has not materialized. The origin of Cirkus Benneweis dates back to 1887, when Gottfried Binneweitz (1865-1933) obtained a license to perform as "artist and musician" and began to give outdoor circus performances in Denmark. Gottfried was the son of August Wilhelm Binneweitz (1839-1887), a German traveling musician who had moved to Denmark in the second half of the nineteenth century—following the example of many North-German traveling merchants and performers who crossed the border at that time. Ferdinand’s original traveling company was made of himself and his wife, Marie; Marie’s sister, Josefine, who played the barrel organ (although she was reputedly deaf and dumb); and their brother Alexander, who was an acrobat. They had a couple of horses, and a few farm animals that made up the menagerie. In time, the name Binneweitz changed to Benneweis, perhaps because some local authority had misspelled it on a permit, or perhaps because it sounded better that way. Gottfried’s circus performances did well, and the family troupe began traveling with a small tent, but it would take two more generations before the enterprise Gottfried had created truly became a circus of importance. Ferdinand Benneweis (whose legal name would remain Binneweitz) soon performed in the show as a child acrobat and clownGeneric term for all clowns and augustes. '''Specific:''' In Europe, the elegant, whiteface character who plays the role of the straight man to the Auguste in a clown team.. When he was 27, in 1915, he married 24-year-old Karen Christine Irene Petersen (Nov. 26, 1891-Dec. 5, 1970), a young acrobat who had joined Cirkus Benneweis in 1910. Upon the death of his father in 1933, Ferdinand took over the family circus. Irene could not bear children, but Ferdinand had nonetheless two children, out of wedlock: A daughter, Musse, whose son, Sonny Benneweis (December 29, 1933-July 8, 1979), made his mark as an excellent elephant trainer; and a son, Manfred Benneweis (October 17, 1929-May 30, 1987), who would become a remarkable and extremely elegant cat trainer(English/American) An trainer or presenter of wild cats such as tigers, lions, leopards, etc., with lions first, then with a beautiful group of tigers. In 1915, however, Ferdinand and Irene Benneweis had adopted a son of their own, Eli Johan Holte, who was four years old when his mother abandoned him in Gørlev, where the circus performed in July of that year. Eli Benneweis (1911-1993) was born on August 7, 1911 in Kalundborg, Denmark. He was to become one of Europe’s most successful circus entrepreneurs. Eli was trained in all basic circus disciplines within his adoptive family, and specialized in the presentation of horses, whose number had increased over the years in the circus'stables. On November 26, 1936 Eli Benneweis married a German foot juggler, Eva Charlotte Susanne Stensch (January 4, 1910-September 11, 1999). When her husband, Ferdinand, died on April 10, 1945, Irene inherited Cirkus Benneweis, which Eli managed first in association with his mother. Eli Benneweis proved a smart and ambitious manager, and he quickly became the sole person in charge. Under his watch, Cirkus Benneweis evolved from a mid-sized traveling circus into Denmark’s—and one of Europe’s—largest and most respected circus, and the Benneweis empire expanded beyond the boundaries of a single traveling circus. Right after WW II, the circus industry experienced an extraordinary boom all over Europe, but animal acts, which had become popular before the war, were still very scarce. One of Eli’s first moves was to reduce the large number of horses the show carried, and replace a good number of them with exotic animals and wild cats that Benneweis could rent out to other circuses. 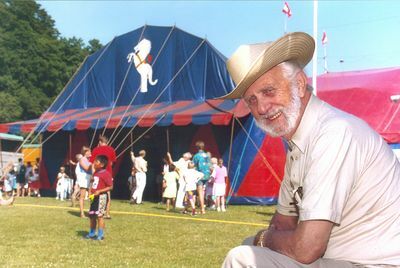 Through engagements of their animal acts in various European circuses, Manfred and Sonny Benneweis became well-known international circus personalities. One of Eli’s most successful associations was with the Italian circus Palmiri. Its director, Egidio Palmiri, didn’t have a large family, and didn’t own animals, which put him in a difficult position with regard to his competition: Major Italian circuses were large family affairs traveling with important menageries; their numerous animal acts (as well as most of their other acts) were presented by various family members. This was the case for the Tognis, the Orfeis, and the Casartellis, but also for smaller circuses. Palmiri struck a deal with Eli Benneweis, and toured the Circo Italo-Danese Palmiri Benneweis in Italy from 1957 to 1965, with hired acts (mostly Italian), and a menagerie base from Cirkus Benneweis. 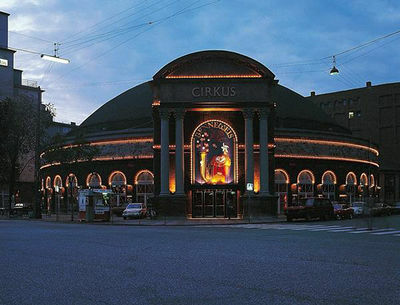 In 1970, Eli Benneweis rented the historic circus building of Copenhagen, at the center of the capital, which the Schumanns had vacated at the end of the 1969 season, after fifty-three years of exploitation. Eli produced shows there each summer until 1990, independently from his touring circus, and the old Cirkus Schumann of Copenhagen became known as Cirkus Benneweis. In time, he also came to own other circuses: Cirkus Korona in 1948, Cirkus Belli from 1955 to 1957, Circus Buster in 1959, and he had interests in Germany's Circus Barum from 1963 to 1967. In the 1980s, however, economic conditions were changing in Europe, and Eli Benneweis began to concentrate his attention to the sole Cirkus Benneweis. In 1990, he left the circus of Copenhagen, whose rent had become prohibitive. He traveled extensively, visiting other European circuses, and his silhouette à la Buffalo-Bill and his white Stetson hat became familiar throughout the circus world. He was President of the Danish Circus Directors Association, and, in 1969, he received a special award from the Danish Ministry of Culture in appreciation of his outstanding contribution to Denmark’s circus arts. He had long established his home at the circus’s winter quarters, in Dronningmølle. Eli Benneweis passed away, after a long a painful illness, on December 23, 1993. He was 83 years old. Eli and Eva had an adopted daughter, Diana (born in 1947), who was the biological daughter of Manfred Benneweis. Diana, who had long been the circus’s principal equestrienneA female equestrian, or horse trainer, horse presenter, or acrobat on horseback. and a fine animal trainer, inherited the family circus, and maintained its stellar reputation as Denmark’s premier circus. Sonny Benneweis married Lis Tolver Jensen (b.1936) on November 12, 1955, with whom he had three children: Kim, born June 12, 1956, who specialized in the presentation of elephants; Michael (known as Miller), born January 20, 1958, who took care of horse presentations; and Jacqueline (born April 26, 1966). Kim and Miller stayed with the circus until 1995, and then went on to work in other Danish circuses. 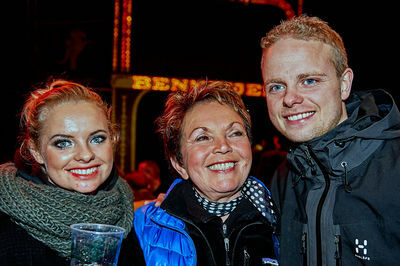 Kim has since returned to the family circus to help his cousin Diana stage several of Cirkus Benneweis’s new productions. Sonny and Lis Benneweis divorced in the late 1970s. On April 9, 1977, Sonny remarried Nelly Jane (Annette Otto Jensen—June 15, 1934-May 21, 2009), the very popular ringmistressFeminine form of ringmaster. of Cirkus Benneweis from 1971 to 1996, who also took care of the circus’s administrative duties.